I haven't seen NBA Rookie of the Year odds at any of Doc's listed sportsbooks for a few weeks. It's tough with odds like those because they often are only active for a day or two. They should be posted again very soon now that there's clarity on Philadelphia's Joel Embiid being ruled out the rest of the season. He had been a -2000 favorite the last time I saw the odds. I will be very interested to see the new numbers because can the NBA's top rookie play just 31 games and not even 30 minutes in any of those? There's no arguing that Embiid has been the best rookie when he did play. That said, nobody has ever won Rookie of the Year playing fewer than 50 games or fewer than 29.1 minutes a game. So we might be looking at a battle of Embiid's teammate Dario Saric or Milwaukee's surprising Malcolm Brogdon. I believe Saric deserves it. He's playing every night and averaging 11.3 points and 6.2 rebounds. He really blew up in February in averaging 17.5 points, 9.8 rebounds and 4.5 assists. Expect Saric's numbers to continue to thrive as he's the clear-cut No. 1 option with Embiid out. I'd put my money there. Philadelphia hosted New York on Friday.Detroit was predictably inconsistent again Wednesday in losing 109-86 in New Orleans. Andre Drummond had 13 points and 17 rebounds before being tossed in the third for swatting at the back of the head of New Orleans' Tim Frazier. Drummond was 1-for-10 from the line as well. The Pistons shot 3 of 17 from the free-throw line, setting an NBA record for futility for percentage (18) on a minimum of 10 attempts. These teams have split two meetings this season and Detroit has won its best two in Philly. Marcus Morris (who is from Philadelphia) is averaging 23.5 points against the 76ers this season, while Jahlil Okafor is averaging 15.0 points against the Pistons. 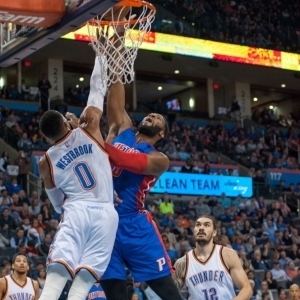 Key trends: The Pistons are 5-1 against the spread in the past six meetings. The "over/under" is 5-2 in the past seven in Philly. Early lean: Pistons and over. Toronto was in Washington on Friday, while Milwaukee hosted the Clippers.Toronto goes for the four-game season sweep of Milwaukee. The injured Kyle Lowry was a big reason why the Raptors lead the series 3-0 as he was averaging 23.0 points, 6.3 assists and 3.7 rebounds vs. the Bucks. Giannis Antetokounmpo is averaging 26.0 points, 8.0 assists and 7.0 rebounds vs. the Raptors, who have taken their past six in Beer Town. Key trends: The Raptors are 5-0 ATS in the past five meetings. The under is 7-2 in the previous nine. Miami was in Orlando on Friday and Cleveland in Atlanta. Do Heat fans still get fired up when LeBron James comes back to town? I'm sure he still has some palace in Miami for the offseason. James will be getting some second halves of a back-to-back off the rest of the way, but I doubt here. This is first of three remaining games between the Cavs and Heat (play again Monday). Miami was destroyed 114-84 in Cleveland on Dec. 9, but the Heat were a much worse team then. No Miami player who dressed for the game was teammates with James when he played for the Heat from 2010-14. Key trends: The home team is 9-0 ATS in the past nine meetings. The over is 4-1 in the Heat's past five at home. Early lean: Cavs (if everyone plays) and over. ABC Saturday night game. Usually the teams in this one aren't coming off a back-to-back as it's a showcase game for the league and thus it wants the best level of basketball possible. Alas, L.A. was in Milwaukee on Friday. Chicago won its 18th straight home game televised by TNT on Thursday with a 94-87 upset of the Warriors. That ended Golden State's NBA-record streak of 146 consecutive games without back-to-back losses. Jimmy Butler had 22 points and Bobby Portis 17 points and 13 rebounds - he has played well since Taj Gibson was traded and opened up playing time. Chicago lost at the Clippers 102-95 on Nov. 19, blowing a 19-point lead. Blake Griffin led the Clippers with 26 points, 13 rebounds and five assists. Key trends: The favorite is 8-3 ATS in the past 11 meetings. The under is 5-2 in the Clippers' past seven. Charlotte is running on fumes as this will be the team's seventh and final game of a road trip. The Hornets had little in the tank Thursday in a 120-103 loss in Phoenix. Kemba Walker led Charlotte with 26 points. Frank Kaminsky left with a shoulder injury. Denver won its second in a row Wednesday, 110-98 in Milwaukee as Nikola Jokic had his second straight triple-double and fourth in 13 games. If Denver is going to make a playoff push, now is probably the time. This game starts a stretch of seven of eight at home. First meeting of season between Charlotte and Denver. The Nuggets swept last year. Key trends: The Hornets have covered one of their past 10 vs. teams with a losing record. The under is 10-1 in the past 11 meetings. Early lean: Nuggets and under. Memphis was in Dallas on Friday, so is Marc Gasol or Mike Conley on sit-down alert here in a potential playoff preview? Houston won at the Clippers 122-103 on Wednesday. James Harden had 26 points as the Rockets extended their NBA record to nine games with 20 or more 3-pointers this season. Every 3-point record is going to be shattered by that team. It was also Houston's 48th straight game with at least 100 points. Memphis is 2-1 vs. Houston this season. The winning team in each game hasn't scored less than 110 points. James Harden is averaging 24 points, 12 assists and 7.3 turnovers in the three. Key trends: The Rockets are 5-1 ATS in their past six vs. the West. The over is 4-1 in the Grizzlies' past five in the second of a back-to-back. Early lean: Rockets and over. Gregg Popovich resting players alert here with San Antonio playing in New Orleans on Friday. Minnesota won its second straight Wednesday, an impressive 107-80 victory in Utah. Karl-Anthony Towns scored 21 points and grabbed 15 rebounds. Utah was the fourth opponent in the last seven games that Minnesota held under 90 points. Tom Thibodeau's defensive efforts are starting to pay off. The Spurs have beaten Minnesota nine straight times - including six in a row at the AT&T Center. Key trends: The road team is 5-0 ATS in the past five meetings. The under is 4-0 in the Spurs' past four. Brooklyn could rest Brook Lopez in the second of a back-to-back as it was in Utah on Friday. Portland beat Oklahoma City 114-109 on Thursday. Damian Lillard had 33 points and Jusuf Nurkic 18 points, 12 rebounds, six assists and five blocks. He might have been a trade steal from Denver. Nurkic became just the third NBA player to have 15-plus points, 10-plus rebounds, five-plus assists and five-plus blocks in a game this season, joining Kevin Durant and Giannis Antetokounmpo. Portland did learn, however, that forward Ed Davis likely will miss the rest of the season. The Trail Blazers defeated the Nets, 129-109, in Brooklyn on Nov. 20. CJ McCollum scored a game-high 33 points. Portland has won the past three at home in the series as well. Key trends: The Blazers are 10-4 ATS in their past 14 on Saturday. The over is 5-2 in Portland's past seven at home vs. teams with a losing road record.